It’s all over, bar the accounting! The only thing that we couldn’t control was the weather and it let us down big time. But as a result of an appeal to Barbara at Cotswold Marquees on Friday morning to increase the size of the marquee we all got under the one roof on Sunday and the party carried on largely unaffected despite the continuous downpour and squalls outside. Monday was an entirely different day and the outside activities were enjoyed in sunshine. 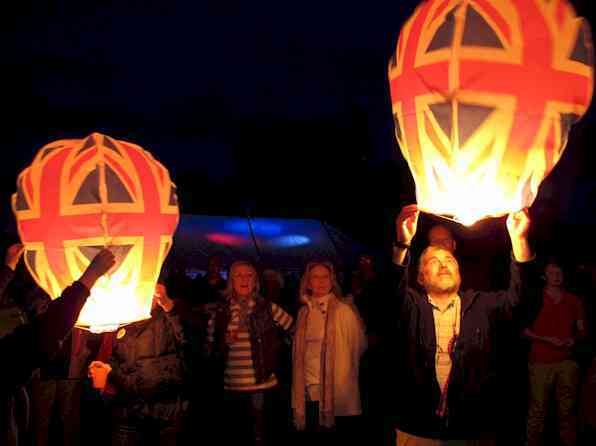 We even managed to launch the lanterns at dusk as the wind dropped completely and what a spectacle that was! They were seen and appreciated by those lighting beacons on the hilltops around the area. … For supporting the event and joining in with the competitions organised for your entertainment. Personally I was heartened by the number of people that turned out at 8am on Sunday morning and I knew then that the event would be a success. Thank you to all who contributed in so many different ways over the weekend. 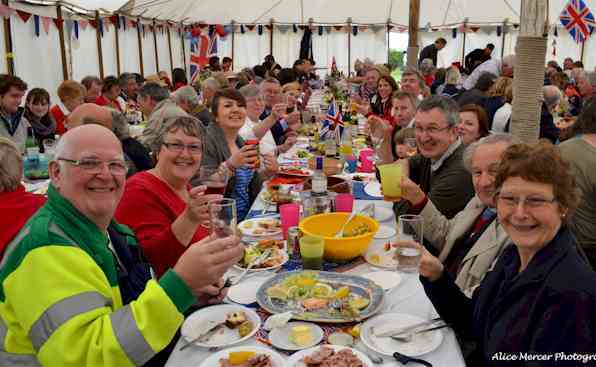 It made running the event very easy and it was a pleasure to see the village come together to enjoy themselves. I particularly want to thank members of the committee who helped with the planning and preparations over many months. I have received many comments and notes of appreciation which extend to all involved. I would like to recognise the following for their contributions: Members of Oxhill Parish Council for their support; The Village Hall Management Committee for the loan of equipment and allowing the event to be run under their jurisdiction; Janet Gardner for allowing the use of her field and Brian for many hours spent preparing it; Jill & Colin Tucker for allowing the use of the Old Chapel; Brian & Sarah Hobill for donating the pigs, organising butchery and transport; Tom and Carol Fox & family for running the pig roast; Thomas Fox for the loan of vehicles; Ettington Chase Hotel for supporting accommodation requirements; Brenda and Ian Hughes for supporting PA requirements; Hugh Rouse for allowing the cold store trailer to reside on his drive and for providing an electric supply to power it; Charles and Nadia MacCall for providing the electricity supply to the marquee; Robin Teall for the electrical installation to the marquee; Ian Broderick for providing and installing the lighting equipment in the marquee and on site; Kineton Scout Group for the loan of tables and storage trailer; Red Horse Fuels for their sponsorship; Martin Cronin for organising the lift platform and to Rae Pickles for operating it on Sunday. Thanks are also due to the following event coordinators and the teams who supported them; Catherine Kimmins and the Bell Ringers; Rev. Nicholas Morgan; Oxhill Wild Life Society (OWLS); Grenville Moore and the Big Lunch Team; Lucy Mercer for finding out that ‘Oxhill Does Have Talent’! ; Adrian Marklew for preparing the quiz and Robin Teall for asking the questions; Ed Bracher and family for the Hobby Horse races; Doug Nethercleft and the O’Donnell family for the field games; Andy Buchanan for the Water Volley Ball; Guy Loveridge and Thomas Fox for the Tug-O-War; Gaynor Fila and Ruth Mercer for afternoon teas and the pig roast supper. Also thanks are due to the Oxhill Artists group and Barbara Kenny for organising the exhibition of their paintings. Finally I want to express a very special thank you to Mick and Barbara Shepard for providing invaluable medical cover throughout the weekend and to Mick for assisting me throughout and for providing essential tools from his comprehensively equipped vehicle. Should there be any remaining questions about the event then please contact me. Mike Collins 680564 or by e-mail to diamond.jubilee @ oxhill.org.uk.